A B-52 Stratofortress arriving at Morón Air Base, Spain, deploys a drogue parachute to slow itself after landing, Feb. 27, 2016. 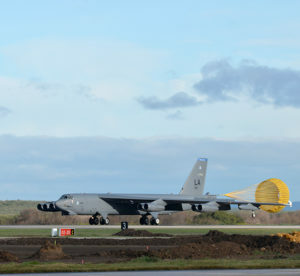 Three B-52s from Barksdale Air Force Base, La., will be temporarily reassigned to the 2nd Expeditionary Bomb Group for the duration of a large-scale NATO military exercise in which they will participate. The Norwegian-led Cold Response 16 will involve approximately 16,000 troops from a dozen allied and partner nations and last nearly two weeks. 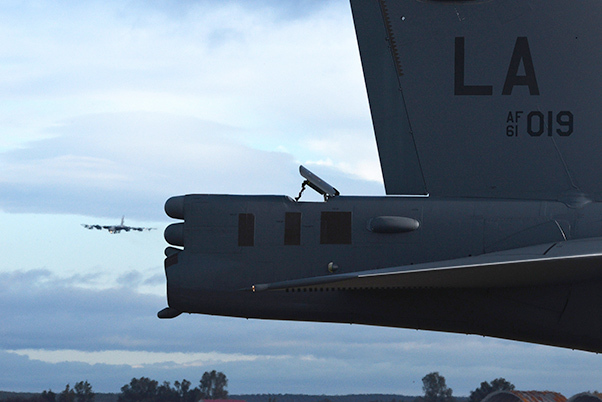 B-52 Stratofortresses from Barksdale Air Force Base, La., arrived in Europe Feb. 27, in preparation for their participation in a large-scale NATO training exercise. This year’s iteration of the biennial Cold Response will be held in the central Trøndelag region of Norway and feature air, ground and maritime operations. Approximately 16,000 troops from a dozen nations will participate in the exercise, working together to collectively develop tactics, techniques and procedures for combat operations in an extreme cold-weather environment. The B-52s will conduct multiple sorties over the course of the exercise, engaging in simulated strikes against ground targets inside the training area. As the Air Force’s premier nuclear-capable, strategic heavy bomber, the B-52 is capable of delivering a large payload of precision nuclear or conventional ordnance over long distances while also providing decision makers the ability to rapidly project military power. B-52 Stratofortresses land at Morón Air Base, Spain, Feb. 27, 2016, in preparation for their participation in exercise Cold Response 16. The large-scale NATO military training exercise will take place in the Trøndelag region of Norway and emphasize coordination between international forces in an extreme-cold environment. Troops from a dozen nations will engage in maritime, ground and air operations over the course of nearly two weeks, perfecting coordination between their respective forces. 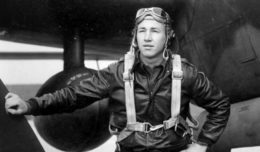 “Bomber participation in joint military exercises like this one are an expression of the U.S. commitment to supporting our allies and partners, demonstrating our shared dedication to promoting global security and stability,” said Maj. Matt Spinelli, the 2nd EBG assistant director of operations. 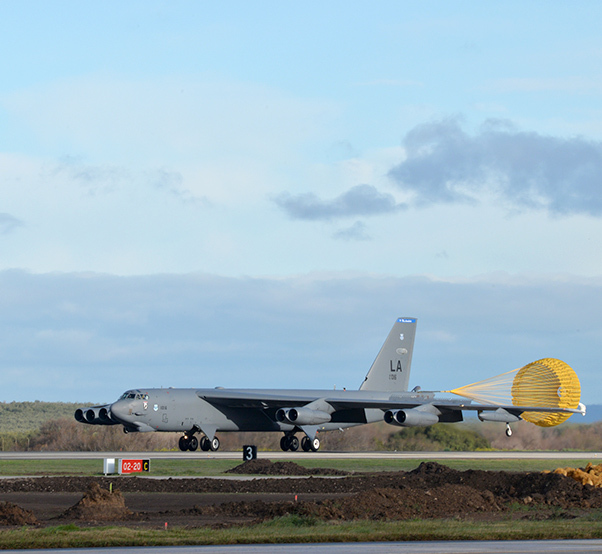 The B-52s will join with KC-135 Stratotankers and F-16 Fighting Falcons to serve as the American air component for the duration of Cold Response 16. A number of C-130 Hercules will also be on hand to provide support to ground forces. Cold Response 16 is scheduled to run through March 9.